NEC-SE was the first to point out the links between Italy purchasing oil from ISIS in Libya and the possibility of Egypt having to introduce ground forces to ensure those oil fields do not make money for Italian oil companies which themselves have been rumored to be tied to organized crime in Italy. Any way you look at this bombing you have to agree that their are multiple possibilities which are tied to the emerging economic battles along with the ideological battles taking place in the region. 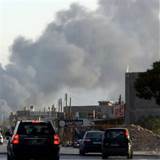 “A car bomb went off in Libya’s capital Tripoli on Monday in front of the headquarters of Mellitah, an oil and gas joint venture between Italy’s ENI and Libyan state oil firm NOC, witnesses said. Residents said there were no casualties. A Reuters reporter said there were smashed windows and damaged doors. In a text message, an ENI spokesman played down the extent of the damage. “Nobody wounded and no significant damage to the office buildings,” he said.